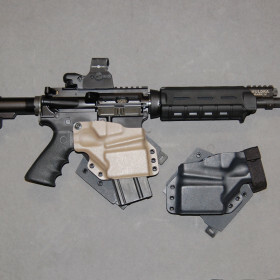 M4 Carbine Holster » Protective Solutions, Inc. Innovative Kydex Holster for AR Platform rifle. Keeps your rifle secure during operations such as pat-downs and handcuffing. Has malice clips to attach to belt or to molle gear. Also comes with safety strap. MSRP $119.00, our price $99.00. Shown in FDE and Black (rifle not included). Only 1 left - Flat Dark Earth (FDE) in Right.